When the world is going digital, you cannot afford to stay behind, the most effective way of doing digital marketing is through emails which is termed as email marketing. The customers get message dropped directly into their mailbox. A useful medium to upgrade your agriculture unit and convert strangers into customers, the best way to reach somebody without offending them can be done through this mail marketing strategy. 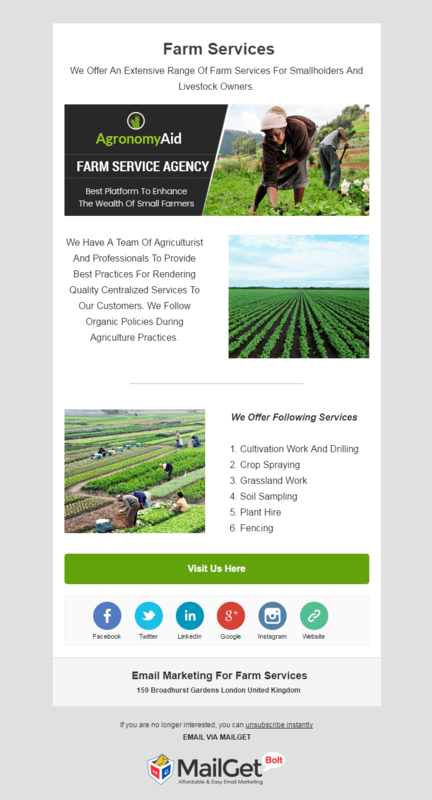 You can share the agricultural services that you provide to your customers in the email template which is exclusively crafted for you to cover all the aspects of your business and bring in more trade in return. 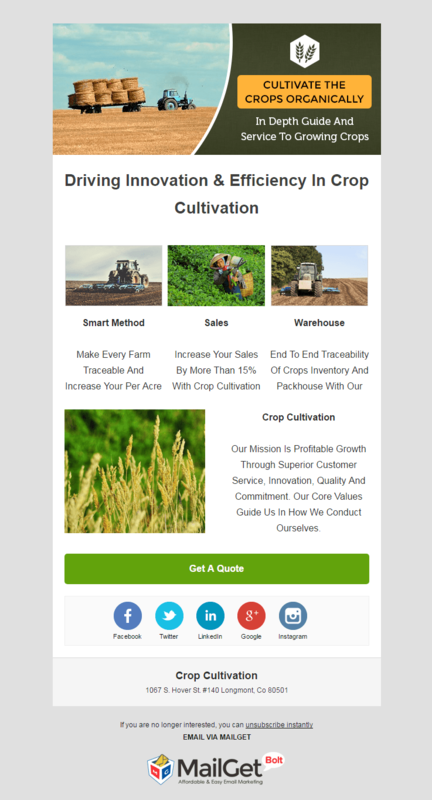 Promote your email marketing service through 10+ Best Agriculture Email Marketing Services For Farming Businesses, Fertilizer Dealers & Agricultural Tool Shops. 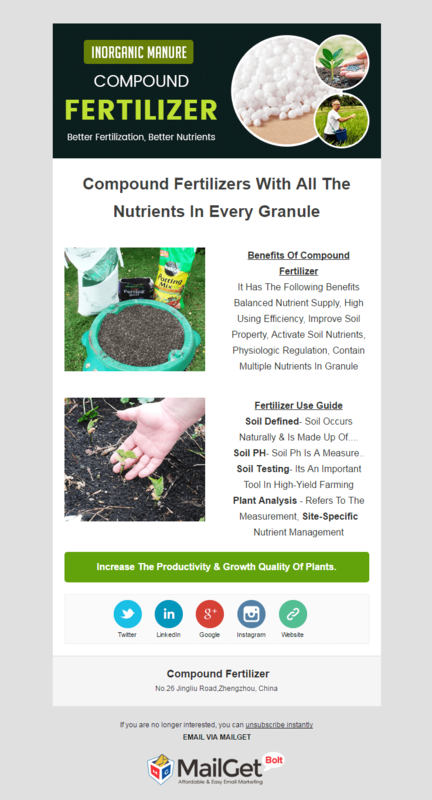 Promote your best and effective compound fertilizers that you deal in, the agriculture business can be taken to leaps and bounds through these email templates which can be created with the drag and drop builder enabling you to include images, texts, and other similar stuff. 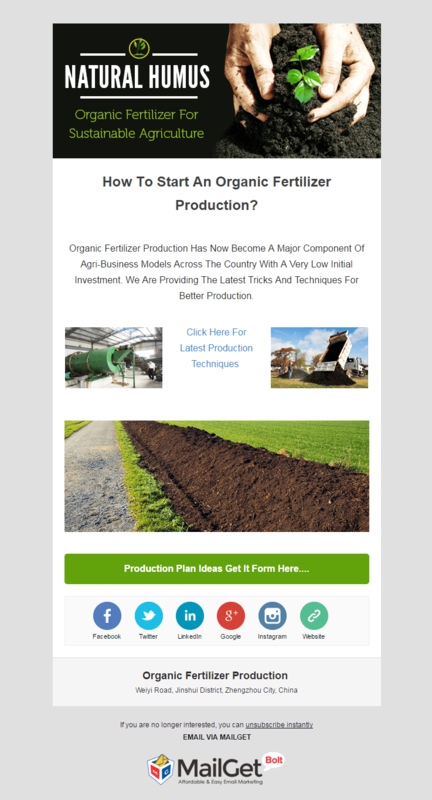 All your organic fertilizers can be projected well through the respective email template which is activated with the bulk mailing features called as drips mailing, which means that you can send numerous emails to your multiple customers which will result in flourishing your business. 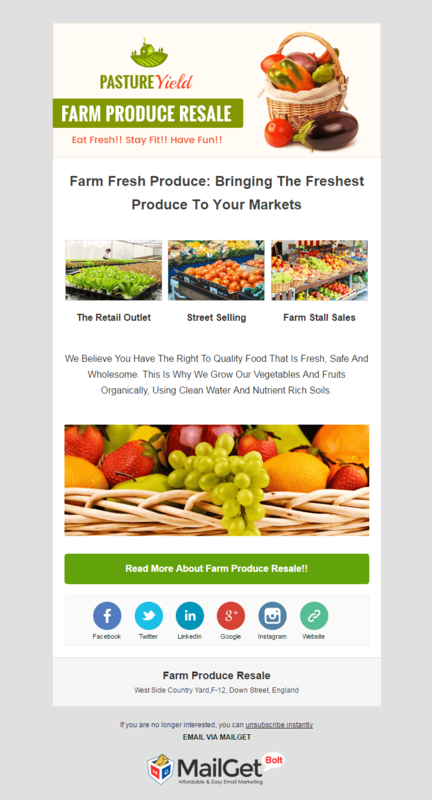 Your healthy vegetables and fruits is displayed clearly through the specific email template, the template is supported with an exclusive feature that allows to you send the mail with 99% inbox delivery rate which results in almost no spamming. 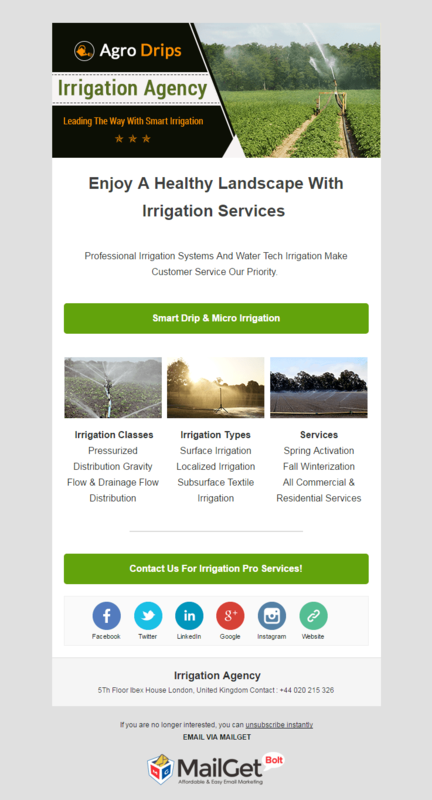 The irrigation facilities that you provide to your customers can be easily depicted in the particular email template, the same template can be used an autoresponder mail which can be sent to the customer as an auto-generated mail when fills the subscription form. 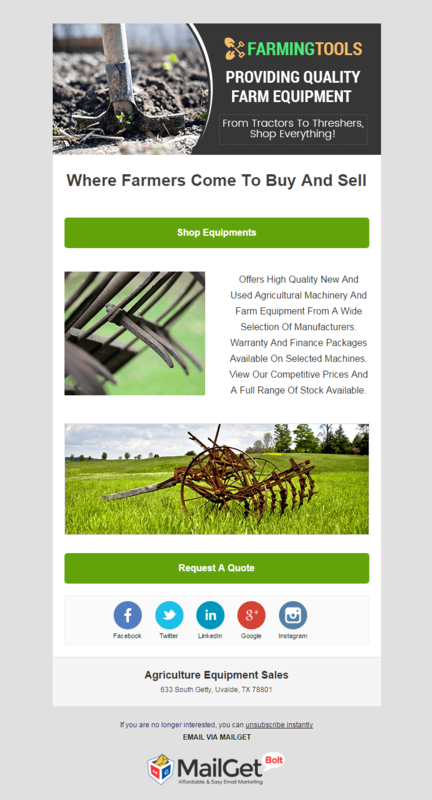 Any kind of machinery or equipment is important in whichever field you trade in and so is the case with agriculture as well, the domain specific email template let you share all your equipment. The email template can be sent as an auto follow up mail when a user has not read or opened the previous mail. 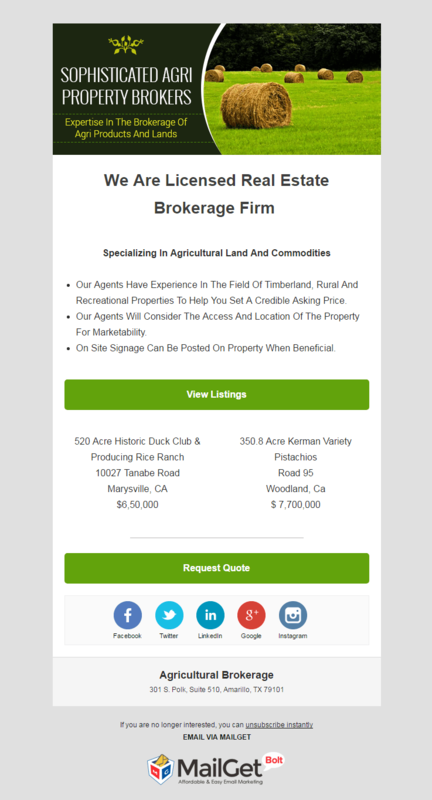 Advertise all your agricultural land in which you deal in and the services you offer as a broker, the email template has a feature known as the personalized tags in which you can refer the recipient’s name, eventually, increasing the chances of your mail getting opened and read. Crop cultivation is an important aspect in agriculture, all your premium quality crop cultivation services can be effectively put at a glance through the email template, The template allows you include a subscription form which will generate leads for you taking your crop cultivation business to great heights. Many factors are involved in the farming which needs to be managed and solved, the farming solutions email template let you lure customers by framing email templates. You can view your template after customizing it in the email inbox preview section as to avoid mistakes and errors. 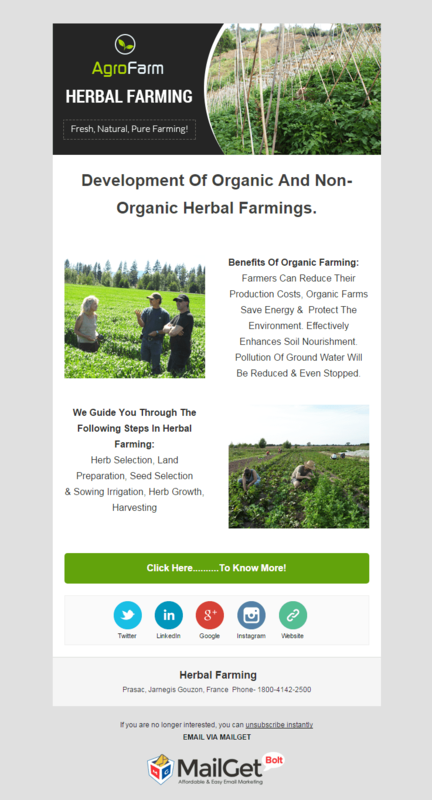 The herbal farming business can be explained through this exclusive email template in which all your services can be featured, The template allows you to track your mail through email tracking feature, the emails whether they are opened or not can be analyzed through it. 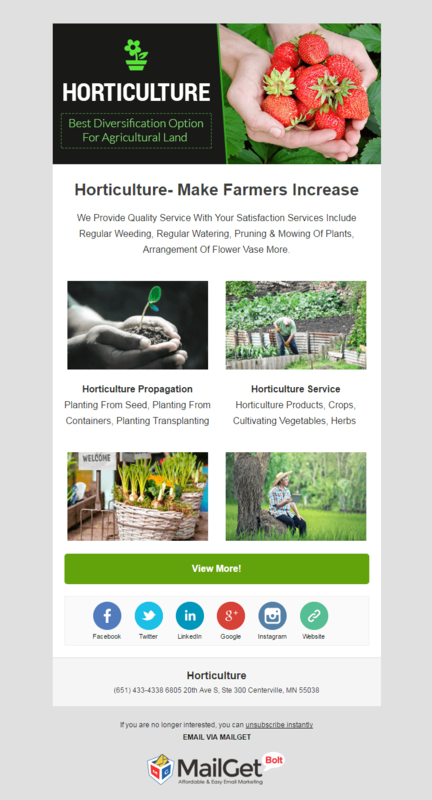 The business persons who wish to have an exclusive email template for themselves can use the email template for the horticulture in which they can specify their business, the single email can be used to send bulk emails to the customers through drip function, this specific feature can save your time while sending multiple emails. 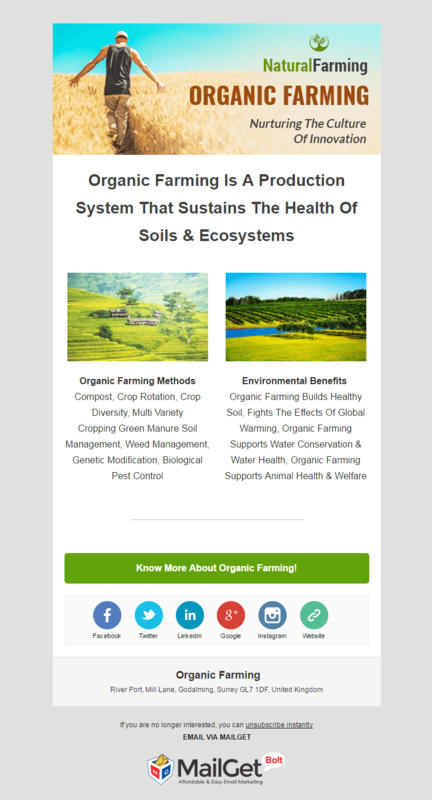 Organic farming is the best form of farming, the traders of the same can use an email template to share their services across the globe, the particular email template can send to a number of persons by importing contacts from the lists. The email marketing templates that has been mentioned and explained above is based on an email software known as MailGet Bolt which let’s create similar email templates, with the software you can create as many email templates you want to create. And if you wish to use the respective tool and customize your email templates then try t through MailGet Bolt.